When you live in the midst of the Millevaches Regional Nature park, it always pays to have your camera with you. 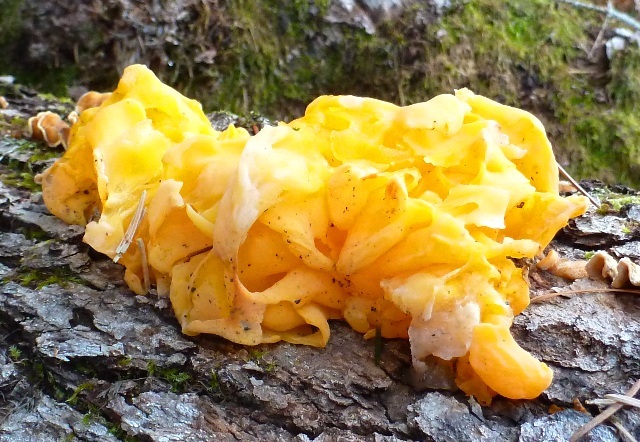 On Saturday, on our way to the supermarket, we stumbled across this bright yellow, jelly like fungus.. This gelatinous fungus is known by several wonderful common names; yellow brain fungus, yellow trembler, and my favourite, witches’ butter. 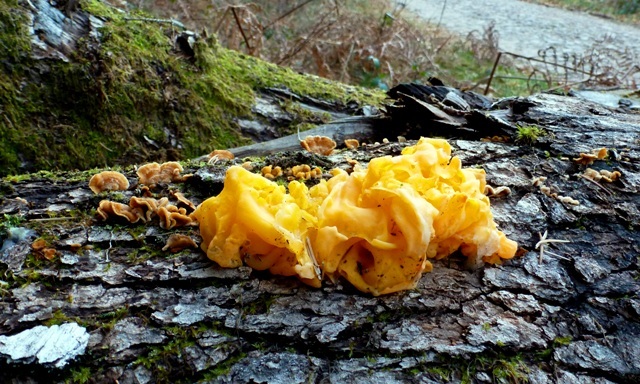 Yellow brain fungus is mainly found during winter, following periods of heavy rain. 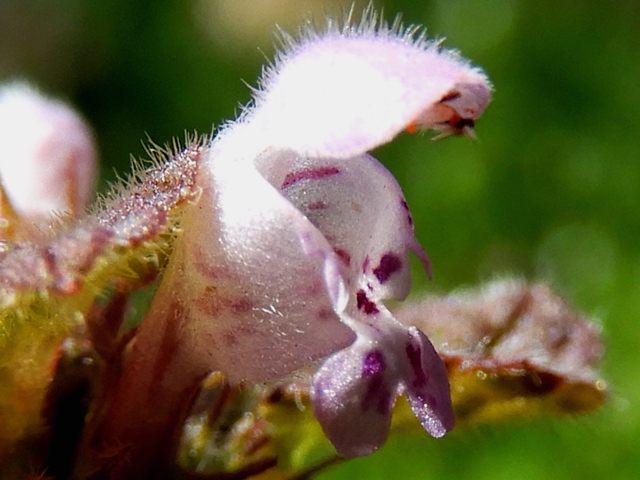 It can be found on dead wood or recently fallen branches of deciduous trees. Yellow brain fungus lives parasitically on other wood rotting fungi, that is to say that it is living off another fungus, usually of the Peniophora genus, rather than feeding directly off the rotting wood itself. The colour of the fungus can vary from bright yellow to deep orange. In dry weather the fungus is much harder to spot as it loses its jelly like appearance and instead forms a hard orange bracket. According to an Eastern European legend, if witches’ butter appears on the gate of your home, then you have been put under a spell by a witch. To break the spell the fungus must be pierced by a sharp object, releasing its juices and thus killing it. With all the rain we’re having at the moment, there’s a good chance you’ll see yellow brain fungus on your travels; let’s just hope it doesn’t appear on the entrance to your home!